Relay races are a fun and engaging tradition in many families. However, unlike a regular race in which there’s a single winner, players compete together as a team. The players on the team must work together to finish the race as quickly as possible. In a traditional relay, the players take turns completing the race course. The team (or teams) whose players complete the race first wins. It can be kind of confusing if you’ve never seen a relay race. Here’s a great video of a 4X100M relay from the 2012 Olympics that may help you understand better. Cooperation is key in relay races. Players must work together the best they can to complete the race as fast as possible. This makes it these races perfect for team-building activities and family gatherings. 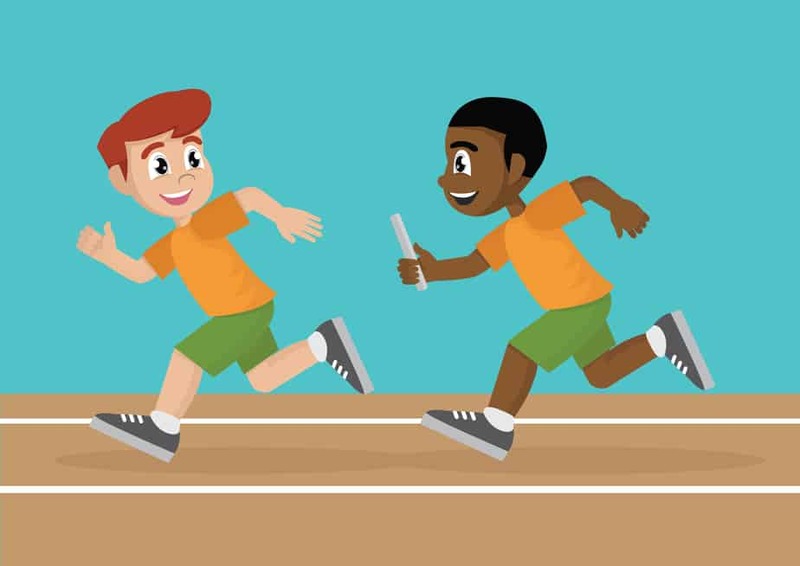 You can also mix your traditional running relays with creative relays if you and your family would enjoy a slower-paced game – all it takes is a bit of creativity. In this article, we’ll be discussing 15 of our favorite relay race ideas for your family (or friend) gatherings! By the way, if you like outdoor games and races and want more entertaining ideas, make sure to check out our definitive guide on 106 yard games you can play. A relay is a great way to teach kids the importance of teamwork while having some fun. They tend to be rather silly and not too competitive which makes these games perfect for the younger generations – and we guarantee they’ll have a blast! In a relay, every kid is a part of a team. For more shy kids, this is a great way to instill some confidence in those who are too afraid to stand out from the crowd. 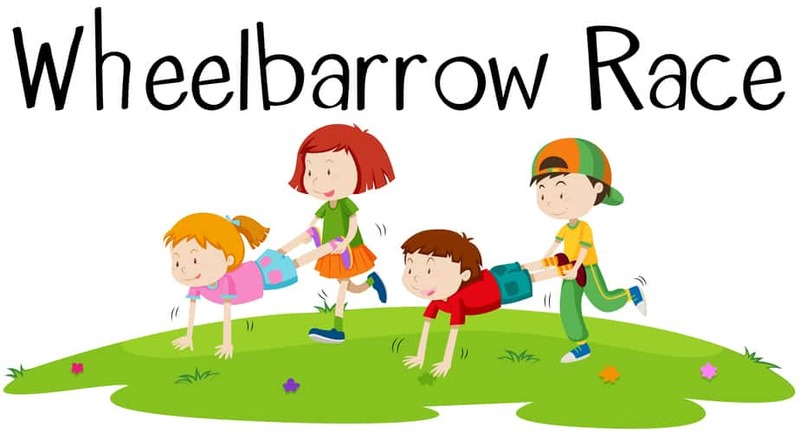 Below we’ve made a list of some of our favorite relay races for kids to play. All that these games take is some imagination and the willingness to be silly! Don’t let the name of this race scare you; it has nothing to do with basketball skills! Here’s how it works: You divide the players into two teams. Each team is distributed across the ends of the race course. For example, if there are 4 players on 1 team, player 1 and 3 would be on the start line while players 2 and 4 stand at the finish line. The same goes for the second team, as well. The goal is to push the basketball from one end to the other using only your head. The next player then pushes it back to the start line and so on. The first team to have all their members complete the course is the winner. This activity is best done indoors on a smooth surface, making it easier to push the ball. Don’t have 2 basketballs? No problem. Replace them with any ball that you have lying around (even a baseball would do). Sakhli (which means “chain” in Sanskrit) is a race that’s pretty common in India, and almost every kid under 10 has played it – Sakhli is their version of Tag, so you can imagine how popular it is! Here’s how you play: Divide the players into two teams and form relay lines (each player lined up one-behind-the-other at the start line). Now each player puts their left hand between their legs while their right-hand grabs the left hand of the person in front of them. So, to reiterate, the player at the front would put his left hand between their legs and the player behind them would grasp the hand with using their right hand – this goes on until the last player on the team is part of the “chain”. At the signal (this could be a whistle or “Go!” – or any other variation of a signal), both teams race to the other end of the playing area and back to the start. The first team to return without their “chain” breaking wins! There’s nothing like a freshly-grilled hamburger and a cold drink as you’re surrounded by friends and family at a picnic. Whether you’re watching fireworks in July or just enjoying a traditional cookout, everyone knows that a picnic needs a fun activity for its party-goers. What’s better than a team activity like a relay? The races we’ve listed below are crowd-pleasing favorites for picnickers of all ages – and we’re sure you’ll love them, too! The sack race is a classic picnic event. In the original version of the game (which you’re more than welcome to play, as well), players would race to a finish line in a sack – it’s somewhat challenging and loads of fun. But our version is slightly different! Here’s a nice variation of the game as a relay: The players are divided across two teams and multiple relay lines are formed. A sack is then given to the first player on each team. At the signal, the players must stand in the sack and race to the finish line. Once there, they can step outside of the sack and move normally. They then run back to the start and pass the sack to the next player. This continues until all of the players on a single team finish the race. In our experience, the first couple of races are pretty inefficient. The first few games are usually won or lost based on how quickly players get in and out of the sack. But eventually, the players will have this action down to a science. If you don’t have 2 burlap sacks readily available, you can replace them with a pair of large, old pillowcases. If the sacks and pillowcases aren’t an option for you, the players can simply hop on one foot and run back to the start. Although, this may not be as fun! In this race, you’ll need to have everyone take off one shoe and put it in a large pile a decent distance away from the starting point. Now, divide the players into two teams and form relay lines. At the signal, players take turns running up to the pile, finding their shoe and running back to their own team’s line. The first team with all its players wearing both shoes wins the game. Keep in mind, the players don’t have to wear their shoe as soon as they find it (this takes away the advantages players wearing slip-on shoes would have). The ideal strategy would include a player finding their shoe and running back with the shoe in-hand. They then proceed to wear the shoe while the next player is completing the race. This race works great for large groups and corporate picnics. In general, the more people you have the better. The three-legged race is a classic for two-member teams. This makes it a bit different from your traditional relay where only two teams participate. During the race, players are paired into groups of two and stood side-by-side. 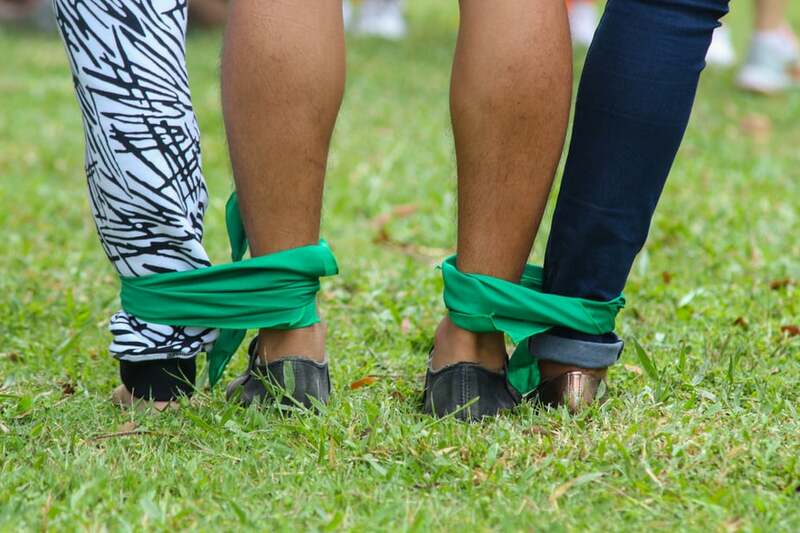 A moderator then goes around and ties the inside legs of the players together using some kind of cloth. The cloth needs to be fastened securely so it doesn’t accidentally fall off during the race. It goes without saying that the cloth shouldn’t be too tight though, you wouldn’t want it to be suffocating! At the signal, each pair must work together to reach the finish line as fast a possible. The fact that their legs are tied together means that both members of the pair must move at the same pace. This is definitely much harder than it looks. This race is also pretty cost-effective, as you can use almost anything to tie the two teammate’s legs together. Here are a few things you can use: a bandana, rope, scarf, and even the lace from a shoe. If you don’t have anything to tie the players together with, linking arms is another way to play and has virtually the same effect. What You’ll Need: At least 2 hard-boiled eggs (it’s better to have more), and 4 or more spoons. Before the egg relay race begins, each player must be given a spoon and divided into two teams. The first player on each team then needs to be given an egg. They must balance the egg on the spoon before the race begins. At the signal, the players will race to the designated finish line and back to the starting point. Once the player is back, they transfer the egg to the next player’s spoon. This continues until all of the players finish the race. But here’s the catch: At no point during the race can your hands touch the egg directly. If your egg is dropped, you can only retrieve using the spoon. However, you are allowed to touch the egg when you’re transferring it to the next player. If possible, you could also have differently-colored spoons so that all players in a team have the same color. For example, Team A would have a red spoon while players on Team B would use blue spoons. A great way to make teams is by having players pick the variously-colored spoons randomly from a bag and joining the players with their same-color spoons. You can make the game even tougher by not allowing players to touch the egg at any point during the race, even as they transfer it to the next player! The name makes the race sound like something you can only play on the beach, but of course, that’s not true. It is, however, best played on a soft surface such as a grass field or even indoors on a mat or rug. The rules are pretty simple: players are divided into teams and each player takes turns completing the race with a crab crawl. So, how do you perform a crab crawl? The player must lie on their back and push themselves up on their hands and feet. Then they awkwardly scuttle to the finish line. We’ve found that the fastest way to get to the finish line is by moving sideways like a crab (hence the name). Some people may find the backbend position a bit too difficult. If this is true in your situation, you can modify the game so that the players are allowed to crawl to the finish line forwardly on their hands and knees. First, players are paired into teams of two. Each team must maintain a wheelbarrow stance in which one player walks on their hands while their partner holds them up by their ankles. At the signal, each team tries to go as fast as they can to the finish line. Once there, they switch positions and race back to the start – so the player who was walking on her hands at the start would now get to hold up the other player. This makes both players equally responsible for the victory. It also makes it easier to race as the player walking on their hands may tire out if they were to be in the wheelbarrow stance the entire race. The first team to get to the finish line and back wins the race. This kind of race really emphasizes the importance of teamwork as the player standing can only move as fast the player walking on their hands. On the other hand (pun intended), the player walking on their hands must completely trust their teammate and let them guide them at a pace that doesn’t cause them to fall flat. The rules for this game couldn’t be any more simple. Players on each team must race to the finish line and back. The first team to have all its players complete the race wins the game. But there’s just one condition: no player on the team can travel the same way as their teammate. So if player 1 on team A completes his lap by running, players 2, 3, and 4 must find others way to complete the race: because now they’re not allowed to run. So player 2 may choose to hop on one leg, player 3 might backward, and player 4 could try to complete the race using only frog jumps. This forces the players to work together and come up with the best strategy to win. For example, you may want your fastest player to finish a lap by running and so on. You also need to be pretty creative in finding different ways to complete the race. The results are also delightfully random because the entire game is dependent on physical skills and creativity, making this one of our favorite relay races to play (and hopefully yours, too). Team-building activities are meant to be enjoyable, as they help team members learn how other people work and solve problems. These activities are also a great way for colleagues to get to know each other better or on a more personal level. At least, that’s what there were supposed to be like. But these days, team-building activities have become a cliche. We can just hear the groans of the employees as they hear about the next team-building event (it’s kind of a funny thought). Most people would rather be off somewhere doing something else – even working (*gasp*, can you imagine?). It doesn’t help the turn-out of these games if they come off as boring, ineffective and childish. But when done right, team-building games are really fun, believe it or not. Players will lose themselves in the game and actually begin to enjoy themselves after a while. To encourage your team to learn about each other while having a great time, we’ve come up with some great team-building games that your team will want to play over and over again. “Pass the Parcel” is definitely not your typical relay race – there’s no actual running involved. Each player is split into two teams and is made to stand one-behind-the-other in a straight line. Before the race, the first player on each team is given a newspaper that is rolled up like a baton. As soon as the race begins, the first person bends over and passes the paper through their legs to the person standing behind them. They then pass it to the next player and so on. This continues until the paper reaches the last person in the line. The race ends as soon as one team gets the paper to the last person on the team. Whichever team gets the paper to the last person first wins the race. As an alternative, you could also have the last player run to return the paper to the moderator. The first team that gives the paper back wins the race. Another fun variation of the game is to get the last person to find an answer in the newspaper. For instance, before the race begins, the moderator will ask something like: “Which team won the football game yesterday?”. When the last player receives the newspaper they must search for the answer. The first team to answer the moderator’s question wins the race. If you don’t have a newspaper readily available, you could also replace it with some other kind of prop (really anything would work). “Burst the Balloon” – the ultimate team-building game! To play, each player is divided into pairs based on their height. A moderator gets the pairs to stand with their backs against each other and their elbows interlocked. Once in this position, the moderator carefully places a balloon between their backs. At the blow of the whistle, each pair races to the finish line. If the balloon bursts, the pair has to come back to the starting position and put another balloon in-between their backs and start the race all over again! At the finish line, the pair must burst the balloon by squeezing it between their backs, and then return as fast as they can to the start line (with their elbows still interlocked). The first pair to make it to the finish line, burst their ballon, and return to the start wins the race. It’s a good idea to have multiple packages of balloons that you can blow-up, even if you don’t end up using them all. Better to have it and not need it than to need it and not have it! First, divide the players into two equal teams. Before the race begins you’ll need to stack up 2 sets of plastic cups on a tray some distance away. After the whistle, the first player on each team has to run up to the cups, unstack them and run back. As soon as they get back, the next set of runners run to the tray and re-stack the cups before returning. This continues until you get to the last player. The first team to have all their players complete the course wins the race. You could also have a slight variation of this by placing cups filled with soda on the tray (one for each player). In this case, the players must run to the tray and chug down the soda (or any other type of drink) before returning. Most people have played dizzy bat or some variation of it during their middle school years. Here’s how it works: split the players into two teams and form relay lines and have two bats kept a decent distance away from the starting line. The players run to that spot, pick up the bat, put their head on the top of the handle and spin around 10 times (enough to get anyone dizzy). After that, the players must attempt to run back to the start line as fast as possible, and then the next player begins the race. The first team to have all their players complete the race wins the game. Getting to the bat is the easy part, but spinning around the bat will get you really dizzy and make you lose your sense of balance. This will make getting back to the starting line incredibly difficult, making this game one of the most challenging races on our list. There’s a reason running on the beach has become so popular these days, it’s super fun. Beach-running also helps strengthen your arches, ankles and other leg muscles. Not to mention it’s also much better for your knees compared to running on asphalt. Below we’ve listed some great ideas that take inspiration from the elements you regularly see on the beach common beach activities. We were careful in considering that you may be carrying a ton of stuff on your day to the beach, and that’s why we’ve provided suggestions that require little-to-no equipment. Water relay is a game you can either play individually or as a team. To begin, you’ll want to set the two buckets on the sand next to each other. Make sure that the buckets are about 50-100 or so feet away from the water. As the race begins, the first player runs to the water, fills their cup and empties it into the bucket. The cup is then passed to the next player. This continues until all the players on one team have finished filling the bucket. The first team to have all their players fill the bucket wins the game. As a fun incentive, you could make it such that the losing team has their buckets of water dumped on their heads by the winning team. There’s even a variation of the game as a regular race: in this case, the players try to fill the bucket as quickly as they can. The first player to get their bucket to overflow wins the game. “Beachball Relay” is a fun beach game that blends traditional beach elements with a relay race. To begin, mark the start and finish lines. Then divide the players into teams of three and give each team a beachball and an object they can wear (something like a pair of sunglasses or a scarf). The team members take turns running from the start to finish, holding the beachball between their knees. Once they complete the course, they pass the worn item and the ball to the next player. If a player drops the ball at any point during the race, they must return to the start line and begin their turn again. The team who completes the challenge first wins the race. We hope you found the above 15 relay race ideas useful, but don’t limit yourself to just our ideas! Be sure to be creative and make your races more personal and fun for the people you’re playing with. Remember that just because a race idea is categorized under “ideas for a picnic” obviously doesn’t mean that you can’t use them at the beach or at home! The games under our categories are just suggestions; and in the end, the kind of race you have is only limited by your own imagination. Have fun playing!